Connects 2 HDMI-enabled devices together. Supports Ethernet for fast wired Internet connectivity. Features a PVC jacket, copper conductors and gold-plated connectors for high-quality performance. 6' cable length offers flexible placement options. 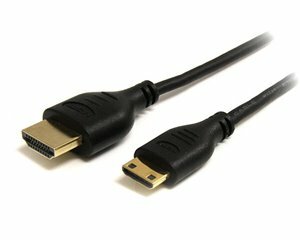 The HDMIACMM6S 6-foot Slim High Speed HDMI® to HDMI Mini cable supports advanced capabilities including Ethernet data interconnectivity with compatible HDMI-enabled devices, and features a thin cable design (3.5mm in diameter) suitable for installations with tight space requirements.